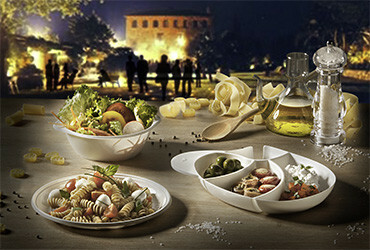 Made of vegetable materials, these biodegradable, compostable disposable dishes are disposed of as an organic fraction along with food waste, thus optimising the waste-management process, reducing environmental impacts, and helping develop virtuous systems, with substantial advantages throughout the production-consumption-disposal cycle. Bio-plastics may also mean reducing the cost of the waste-management process, since composting organic waste, especially if uncontaminated by traditional plastics, usually costs less than disposing of mixed waste in landfills. 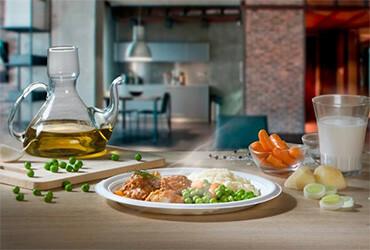 Mater-Bi® dishes are ideal and handy for any kind of hot or cold food, as they can withstand temperatures of up to 80°C and are fit for eating liquid or oily foods too, as bio-plastics typically form a barrier. They look similar to traditional plastics, but, as they are made of Mater-Bi®, they are biodegradable and compostable according to EN13432 and are safe for food contact. 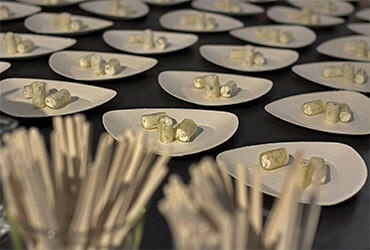 Made of pure cellulose cardboard, they are functional and ideal for eating snacks, including oily foods. Safe for contact with hot and cold foods, they are biodegradable and compostable according to EN13432.